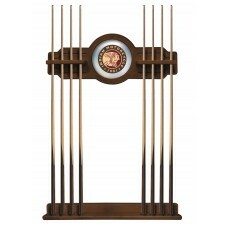 Add our Officially Licensed Indian Motorcycle Cue Rack to your billiard room. Available in 4 stained wood finishes and made by Holland Bar Stool Co. Don't be a poser when it comes to storing your pool cues. These cue racks are the real deal and made with 100% wood and not particle board. You wont have to worry knowing there won't be any plastic holders that break rendering the cue rack useless. That's just not American. Our Indian Motorcycle 2 piece Cue Rack is a must have accessory for your motorcycle logo pool table and game room. The top piece features a CNC routed decorative element and a 10 ½” mirrored center piece that features the Indian Motorcycle Logo. Solid wood “shelves” have routed holes, holding the cue stick in place and will not damage the cue shaft like inexpensive plastic clips. The bottom piece has designated areas for cue stick bumper that are felt lined. Hanging hardware is installed in both top and bottom pieces.